A rare recording by the Polyphone Symphony Orchestra of Chicago performing, from 1898, The Night Alarm. Announcement "Polyphone record, the Night Alarm, played by the Polyphone Symphony Orchestra." A very popular descriptive selection, The Night Alarm appeared in most record company's catalogs of the 1890s  in some, as early as 1889. The selection almost always included the same features: an introduction, "fire! ", a block number being telegraphed, "block 32! ", rousing fire-trucks-racing-to-the-scene music with bells clanging, (quickly) extinguishing the fire, and concluding with a rag-tag fireman chorus. Great fun. 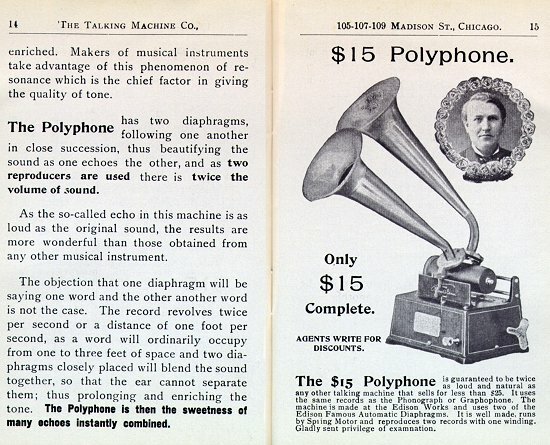 The odd groan sound at the end of the recording is heard on most "Polyphone" records from the Talking Machine Company (see "The Polyphone Groan" below).  began marketing around 1898 a phonograph attachment with two reproducers: The Polyphone. When working properly, the stylus in each reproducer would track the same portion of the recording separated by an inch or two, providing a near doubling of typical volume, plus a reverberation effect (and, as an added bonus, your wax records would wear down twice as fast). Although the attachment should work with any standard record, TTM, not missing an opportunity to advertise their products, proudly announced their records as "Polyphone Records". Even more unusual from the early sound recordings preservation viewpoint, is the presence of a strange-sounding groan heard at the end of most, and apparently unique to, Polyphone records. Although the groan may be simply an artifact of the process used to make copies (for example, perhaps the sound of a brake being applied on the master phonograph), it is heard in sufficiently different ways that gives it a certain comic appeal.